It is really regrettable to reduce a full presidential tour to the purse of the First Lady and the President’s watch. Frankly, it is a shame to hunt for gossip every time a leader takes a presidential tour, then make it the talk of the town, without paying attention to the results. 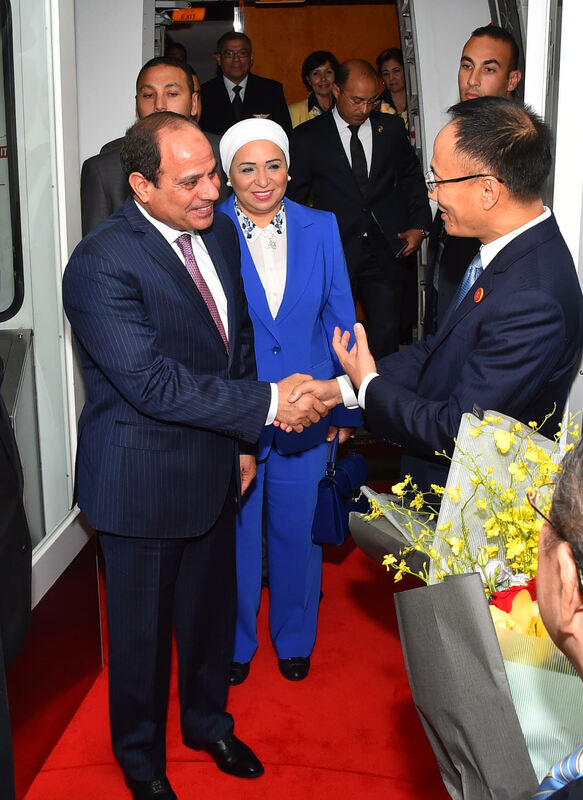 The president’s tour in Asian, and the significance of his attendance to BRICS summit was overlooked by the question; should the president’s wife have carried a purse from Ataba (the cheapest market in Cairo)? Should the president have put on a Jovial watch? It is unreasonable to be so trivial, and unacceptable that gossip be this absurd. Who said that the austerity of the president depends on if he dresses well? Who said that the austerity of the First Lady means that her purse must be Gucci? She represents Egypt, and Sisi is not just an Egyptian citizen; he is a citizen with the title of president. If he is not up to Egypt’s standards, then we would hold him accountable, and I imagine that we talk about why, not a watch or a purse! Did you like Morsi and his wife? The man looked like Ahmadinejad, and both dressed similar to a bus conductor with a stained suit and unpleasant outlook, and his performance not up to the standard to head the municipal council. Was this the model? I say this to the Muslim Brotherhood specifically, because they are the ones who adopt this nonsense on the internet and social media. Was he the man representing Egypt with his guidance office? Still I don’t think that BRICS summit was an essential start for the appearance of the First Lady in and political and social arena, and I’m not with those who ask her for a greater role in the coming period. The First Lady won’t respond to those who ask her to show up. She chose by herself to support the president, and take care of the house on his behalf. The president chose that she makes appearances only for limited occasions over the past three years. Honestly, the first lady will do well if she does not respond to this trap. The Egyptians do not like this. The public mood does not reflect this is what they want. Her appearance will distract attention from the public work, to the brand of dress, purse, and watch. This is not acceptable now, and her appearance doesn’t add to the president. Her appearances would be a concern because the Muslim Brotherhood are hunting for anything. Do not forget that we will be coming upon the presidential elections in a few months. I trust that she will not agree along with the president! Imagine if the first lady went to a social occasion, to inaugurate a charity work, the talk will be directly about her clothes and diamonds. She is, in my opinion, one of the simplest First Ladies in the world, the most disciplined, and aware of attention that surrounds her. Have you forgotten that Melania went in an Italian dress with Trump to congratulate workers, and the talk was about her luxurious dress, which costs $3 million and not appreciation of the workers?! I know that the president did not have his wife accompany him for the “first launch” towards more public appearances. On the contrary, this was a “protocol” thing and ended. Repeat appearances are not repeatable locally, but only internationally when necessary. This is a nod to the First Lady, not to respond to those who demand her to make public appearance.